Erevis Cale has served the Uskevren family loyally for many years. 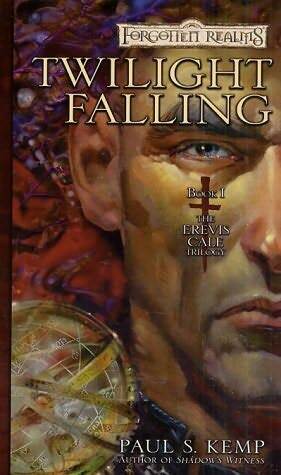 Now, with the death of Lord Uskevren, his son, Tamlin, becomes head of the family and Cale feels it is his time to leave. But after a failed attack against Cale and a botched robbery at the Uskevren house - with the robbers getting half of an ornamental globe belonging to the late Lord Uskevren and a hostage in the form of a house guard - it is up to Cale to figure out what the globe is and to negotiate for the return of the house guard. Vraggen has been on the run from the Zhent network since the followers of Bane began seizing control of it back from the followers of Cyric. To regain control of the network he needs the globe that the late Lord Uskevren possessed, because it will lead him to the Fane of Shadows, which will give him ultimate powers. To help him achieve his ends, he has teamed up with half-drow Azriim and Dolgan - all brawn, no brain. Vraggen, though, doesn't know everything about his partners; they are after far more than he believes. When I started reading the book, the character of Azriim seemed familiar to me, but I didn't think a lot about it because I figured I must have just read a book with him before. Then, near the end of the book, there was a scene that seemed familiar and I realized that I knew what was going to happen at the end because I had read this book before. I hadn't remembered any of the plot details, or even anything about any of the book's heroes, so that probably doesn't say anything good about the lasting impression of the book. All that said, I did enjoy the book. I find it happens a lot more with the Forgotten Realms books than others, but I was routing for the bad guys more than I was the heroes. I don't really know why. There were some parts of the book that required a little suspension of disbelief - no matter the reasoning given in the book, I really doubt a noble family would trade with criminals for the life of one of their house guards. And, given the extent of their powers, there's always the part where I'm thinking, the bad guys really should have already killed the heroes, but of course that would mean no series, so there's always something; they give away the element of surprise, they retreat. Still, all in all, a good book.